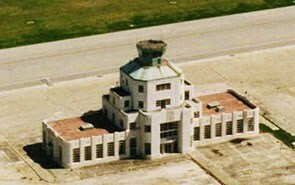 The 1940 Houston Air Terminal Museum - The former Houston Municipal Airport Terminal and Hanger. 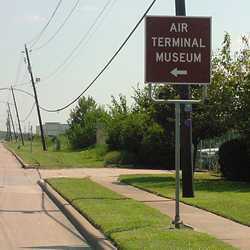 In the late 20s East Texas lumber and railroad tycoon W. T. Carter bought an airfield in SE Houston. As aviation switched from biplanes to monoplanes and passenger flight looked as though it was here to stay, the city of Houston decided that it needed an airfield for civilian use. 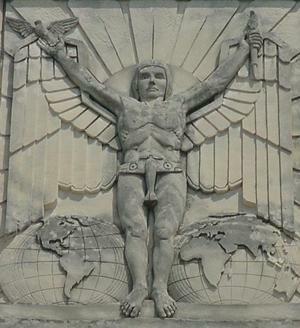 Carter sold the land to the city in 1937 and Joseph Finger, who had just finished designing the Houston City Hall (1939) took on the job of designing the Municipal Airport Terminal which was finished in 1940. 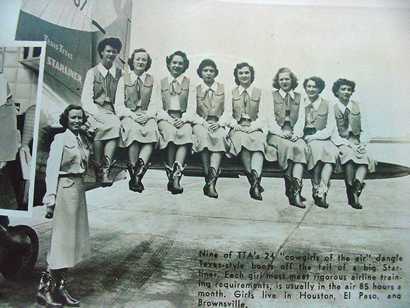 Trans-Texas Airways' "Cowgirls of the Air"
The AIA Architectural Guide to Houston states that the project was completed "with assistance by the Public Works Administration." 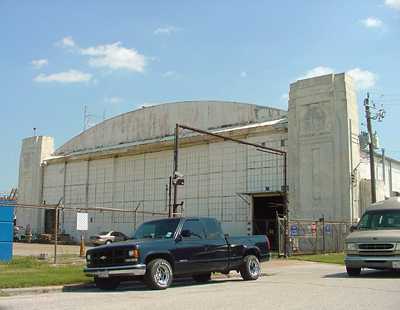 The AIA Guide (an essential volume for anyone interested in Houston History) includes the nearby aircraft hanger in its description of the property. 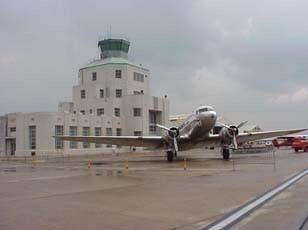 Houston's Department of Aviation demolished buildings that had been "tacked on" to the original terminal building in 1988, bringing it back to it's 1940 appearance. 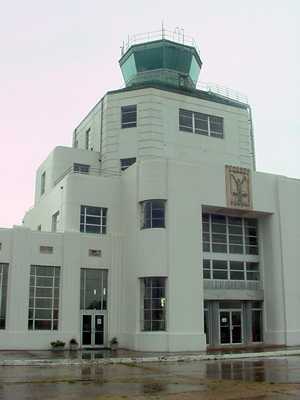 The building stopped activities when it was replaced by the present William Hobby Terminal on Broadway and Airport Blvd. in 1954. "...I received my first U S Patent based on the sight I saw the night I made my first flight from Houston Continental Airport." When I was with a paper manufacturer, we flew into the airport there a lot. I remember one day vividly. When the paper company (Southland Paper Mills) was acquired by St. Regis Paper Company of New York, Southland's pilots flew the company plane into Houston to turn it over to St. Regis. The plane's landing gear collapsed and skidded down the runway. No injuries, except to the pilots' pride. St. Regis never forgave them for giving them a wrecked plane on the last day of Southland's existence.